The month of November is all about the beautiful family you've created through a simple wish—a wish that transformed into the grand miracle of being a loving and caring parent to a child. Since November is National Adoption Month, we'd like to celebrate parents and family members who have dedicated their love, resources, and efforts to welcoming children into their hearts through adoption. We'd also like to honor children who have found wonderful, warm homes and families through adoptive parents. Put Me In The Story is excited to announce that the personalized version of Marianne Richmond's I Wished for You: An Adoption Story has found a home in Put Me In The Story's collection. Our hope is that this title will offer adoptive families everywhere a creative and intimate way to share their family's adoption story with their child and those close to them. 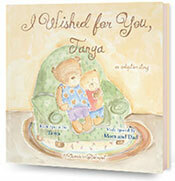 Personalize this adorable book and make this story your family's own. Your child's name will appear on the front cover and throughout the text. 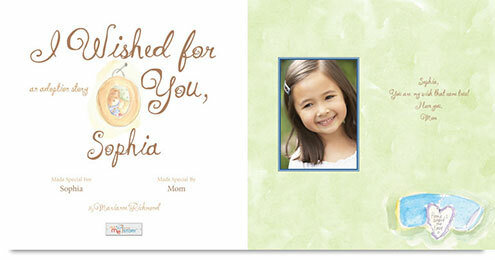 In addition, you can upload your special child's photo and include a message on the dedication page. Marianne Richmond's beautiful words and illustrations will become yours to share with your little one and those you love.